Author Rod Judkins explores how creativity can be unlocked across 57 different mini chapters in this engaging little book, published by Hardie Grant. Are you a creative person? Given the nature of my website I suspect that almost all my readers would regard themselves as creative in some way – and if not actively creating themselves, then appreciating, encouraging and inspiring the creations of others. Otherwise you wouldn’t be here, right? In fact I agree with Rod Judkins when he says that we all of us have the potential to be creative. I would go even further and say that humans are instinctively creative or we would not be where we are today, with an advanced society that generates so many amazing ideas in every area of life. But maybe you are reading this and thinking ‘Pah, I don’t feel very creative. At least, not as creative as I’d like to be.‘ Well, fear not for help is at hand with the aid of Change Your Mind: 57 Ways To Unlock Your Creative Self from Hardie Grant, a nifty little yellow book by the aforementioned RCA fine arts graduate Rod Judkins, who lectures in creative thinking at places such as Central Saint Martins. 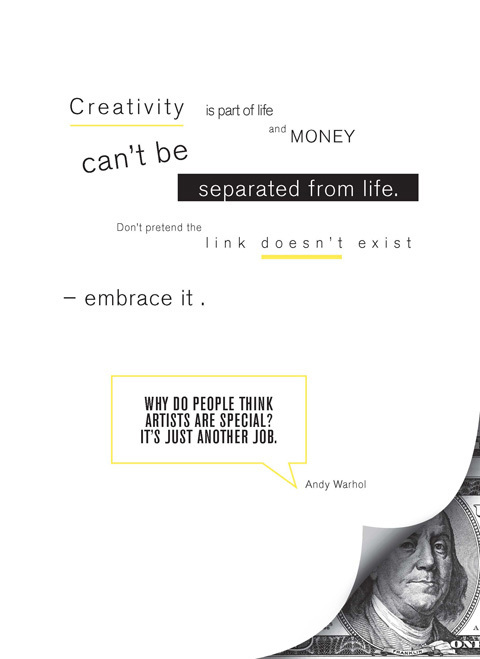 According to Judkins self belief accounts for 90% of success, and this book is here to bolster just such a positive outlook when it comes to creative thinking. I must admit when I first saw this book I thought it might just be a lot of hot air like so many others of this ilk, but it proved me wrong. Sure, it’s petite, pretty to look at and easy to digest, either by dipping in and out of for inspiration, or in just an hour or two wholesale. But it also contains plenty of great ideas backed up by handy quotes from famous people and interesting historical facts. Some ideas are more controversial than others, for instance Judkins implores us to embrace technology – or risk being overwhelmed by it. There are probably many determinedly luddite artists who disagree with him. He also says that ‘People will support someone with a passion. They will want to help you and money will be part of that help.‘ Having run Amelia’s Magazine for nigh on ten years, during which time I’ve had no great offers of financial worth, and indeed have barely scraped together a living, I’m not sure I wholly agree with this postulation: it might give people false hope. But then again, I am a living breathing example of passion driving someone forward or I wouldn’t be writing this today: I run Amelia’s Magazine because I can’t help myself. 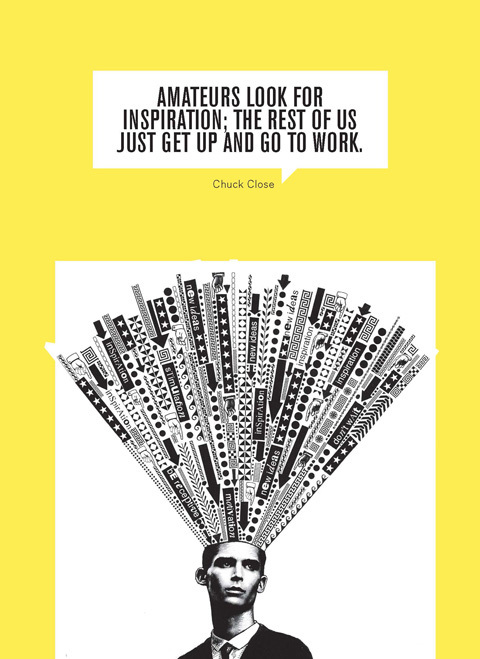 Many of the snappily titled mini chapters undoubtedly offer good advice: creatives are urged to Live the Dream, to let their minds wander to create the stuff that our world is made of. Collaborate, innovate, don’t find excuses for why you can’t create, make sure you hang out with people who encourage you, not those who pull you down. Don’t strive to be original, when producing imitations often sparks the creation of brand new work. One of the most fascinating elements of this book are the little details such as the fact that Francis Bacon copied Picasso: you can imagine Judkins entrancing his students as he metes out these tidbits in his lectures. I particularly like this quote: manna to someone like me, an inveterate hoarder who has a house full of stuff that I’ve collected just in case I may need to use it in a project one day. In the next breath though, we are urged to make our workplaces streamlined… that one I could do with working on. The book ends with the comment that ‘While everyone else is thinking of reasons why a task is too difficult, impossible, the creative are thinking of reasons why it’s possible.’ So, what are you waiting for? If you need anymore persuasion why not pick up a copy of Change Your Mind for yourself? It’s a pleasure to read and I’m fairly sure it will get those creative juices flowing. And if you are in need of more practical help, there’s always the Startup Showcase from the School for Creative Startups: on this weekend at Somerset House. There’s a fascinating array of speakers including my mentor Patricia van den Akker of The Design Trust. 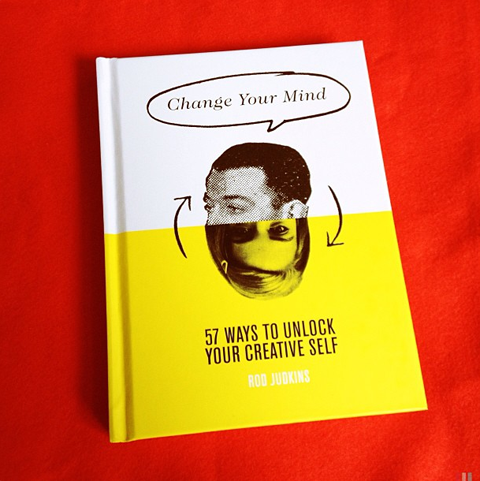 All images courtesy of Change Your Mind: 57 Ways To Unlock Your Creative Self, published by Hardie Grant. Hi Amelia, Central St Martins are tweeting one of these tips per day to the students for the start of the new academic year. I wonder if they are any use to your audience? 1. TURN FEAR INTO FUEL: It’s natural to be apprehensive when embarking on a new venture. A writer starts with a blank page, an artist, a blank canvas, and a composer, silence. Successful writers and artists and musicians don’t have any less fear when staring into the unknown than anyone else. What distinguishes them is that they engage their fear. They turn anxiety into energy. Action transforms their fear into vitality. Fear becomes fuel. 2. GO FURTHER THAN TOO FAR: We all have a comfort zone in which we feel safe. Comfort is not stimulating but stifling. Step outside and be challenged and inspired. Try to be adventurous everyday and it will become second nature. Only by going too far can you find out how far you can actually go. You can’t learn to swim if you insist on keeping one foot on the ground. 3. BE HERE NOW: The successful creative mind focuses totally on the task in hand. When daydreams, phone calls or emails disrupt your attention, you are prevented from concentrating fully. You need to create a situation where you have no choice other than to focus. 4. BE AN EXTREMIST: How far can you take things? Be extreme, radical, intense and excessive. Whatever you are doing, push yourself and your work to the limit. Examine every aspect of your work. Then push them as far as possible. By going to extremes you break new ground. What can be exaggerated, overstated or understated? How would you approach your project if you had all the resources in the world, or no resources? 5. 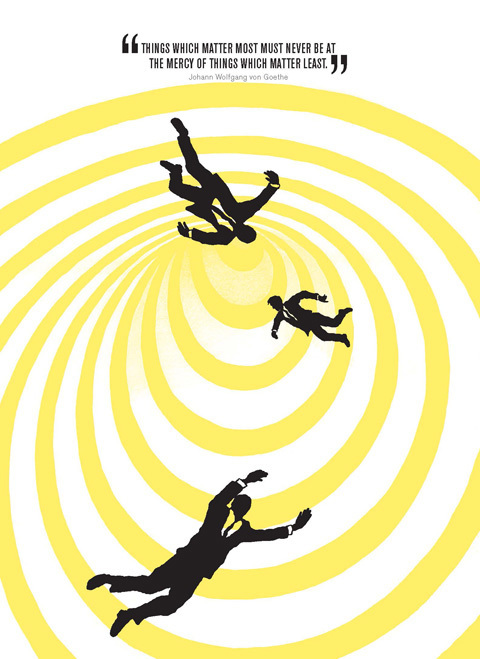 QUESTION EVERYTHING, EVERYWHERE, FOREVER: Many problems arise from making assumptions. Questioning destroys assumptions. Ask questions of yourself constantly. You can learn more by looking for an answer than by finding it. 6. FIND WHAT YOU’RE NOT LOOKING FOR: To live creatively you have to surround yourself with things that interest you. It’s hard to be creative if you’ve got nothing to be creative with. If you start with nothing you have to invent everything from scratch. The more information you gather, the greater the resources for the formation of new ideas. Creative thinkers are collectors. 7. KEEP GOING, EVEN WHEN YOU CAN’T: To achieve anything worthwhile takes persistence. It is a common belief that creativity is something you are born with and others can only envy. Wrong. Creativity is a skill that everyone can learn. People understand that to become skilled at tennis or skiing you have to put in hours of practice. The same is true of creativity. 8. IT’S DOWN TO YOU: Successful creative people work wherever they are and however they feel. They don’t wait for ideal conditions because they may never happen. The perfect workplace or mood does not exist. Don’t let anything stop you from being creative, wherever you are and however you feel. 9. STOP MAKING SENSE: In our life and work we often feel under pressure to do what is sensible. To live a creative life you need to be liberated from being sensible. Enjoy doing something for the pleasure of doing it. Not because it is the logical or rational thing to do. The purpose of doing something is the pleasure you get from doing it. 10. CREATE MEANING NOT PRODUCT: What is the meaning of your work? Creative people focus on the meaning of what they do. They ensure that what they do has significance for them and, therefore, for others. Their concern is to produce something worthwhile that has real human value. They care little for technique or slick effects.